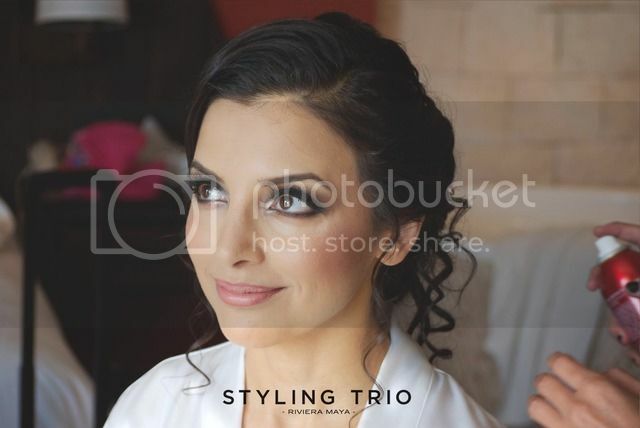 Q & A: Should I Have a Hair & Makeup Trial Before the Wedding Day? Is it necessary for me to get a hair & makeup trial done before the Wedding Day? "We often get asked by brides if a trial run before the wedding is really necessary. As part of the Styling Trio team here in Mexico, I started working on this piece a few weeks ago and decided to visit a few brides on their wedding day who had had trial runs days before and ask them this question. I knew my answer was YES, simply based on how the hair and makeup artists' minds work but I wanted to get insight from actual brides. Some of my favorite answers from brides were: “Not having a trial was never an option!” and “You wouldn’t book a photographer without looking at their work?” And they are so right! Even though nowadays it's real easy to see the work of a hair and makeup artist via their social media profiles or on a website, but the reality is every bride is different. We're all unique in this world and good artists know that not every technique works for every client. Artists may have their mark and a particular style but it’s definitely not a “copy-paste” situation. One thing I see among brides that have had a trial run is that on their wedding day, their hair and makeup is always better ... ALWAYS! Let’s not forget that we are working with creative perfectionist-types (i.e. hair and makeup artists), and after a trial run, their minds will still be working and thinking how can they make it better. The good news is, they have another opportunity to make it perfect. The second time around, the artists know the recipe for your hair and makeup and know exactly what to do and what not to do to create their masterpiece. The trial is also essential because when the big day comes, artists have to stay on schedule and therefore the time frame to finish may be shorter, but by then, they already know what they plan to do and so it streamlines the process. Trial runs are also great for creating good energy and an easy going vibe for the wedding day because by then, everyone has already met and knows one another. This tends to put brides at ease and make it more comfortable, and believe me, when you're relaxed, it helps your hair and makeup look flawless and getting ready will be fun and easy! I know that a trial run is not an option for all brides because of busy schedules or perhaps the budget doesn’t allow for it, so in the event you decide not to or can't have a trial, don’t worry! My advice is to go through the artist’s social media and view pictures of his/her work. If you like what you see, then I wouldn’t be worried about them doing a good job on your wedding day. The photos they post are an excellent representation of their work. The only thing that you will need on your wedding day is good communication and patience! This helps keep both you and the artist relaxed so they can do their very best for you. The artists always want to make sure you’re happy but it may take a little extra time to achieve the perfect look, so be sure to factor in this additional time needed either before the ceremony or before your photographer comes to shoot the "bride getting ready" photos. All the brides I met looked absolutely gorgeous. Samira, the bride featured in the photos in this post, was one of them. She scheduled the hair and makeup trial on the day of her welcome dinner party and after the trial run, the artists changed her hair and makeup so she had a different look for the evening's dinner. My advice is to take advantage of the trial and book it before the rehearsal dinner or Sangeet or even for a pre-wedding photoshoot!" If you have a question you'd like us to "Ask the Expert" message me (MarieSamSanchezPhoto) and we'll feature your question and answer on a future post! "Ask the Expert" features commonly asked questions by brides and grooms with answers and insight provided by our very own Best Destination Wedding Forum experts. Great article and YES, you should definitely do a trial before your big day!